I always love hiking to beautiful, hidden waterfalls. So when I finally had a chance to hike to Yost Run Falls and Kyler Fork Falls in Sproul State Forest, I was excited to check another item off of my Pennsylvania bucket list. 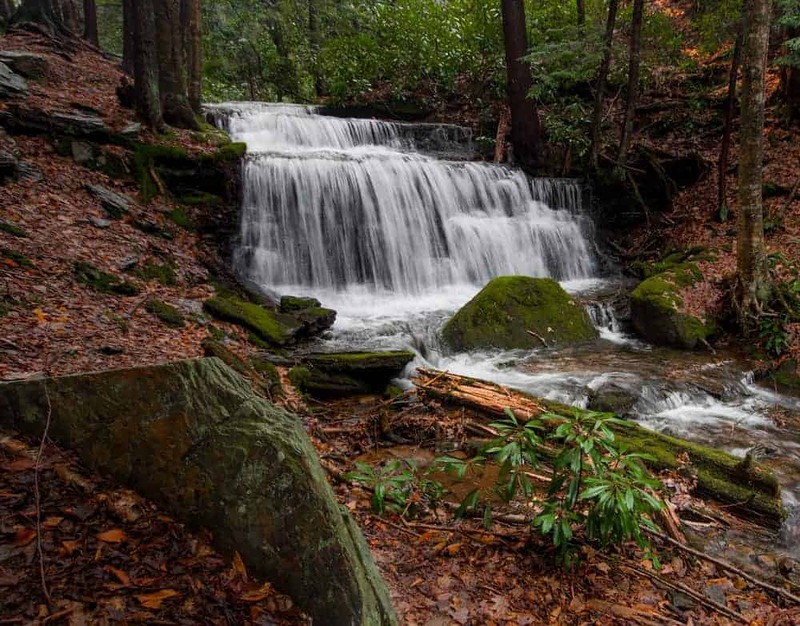 Yost Run Falls and Kyler Fork Falls are located along the Chuck Keiper Trail, a 53-mile loop trail located in Centre County and Clinton County. These two waterfalls are located along a portion of the trail shown on the map as the Yost Run Loop, and it’s possible to make a longer, loop hike when you visit. 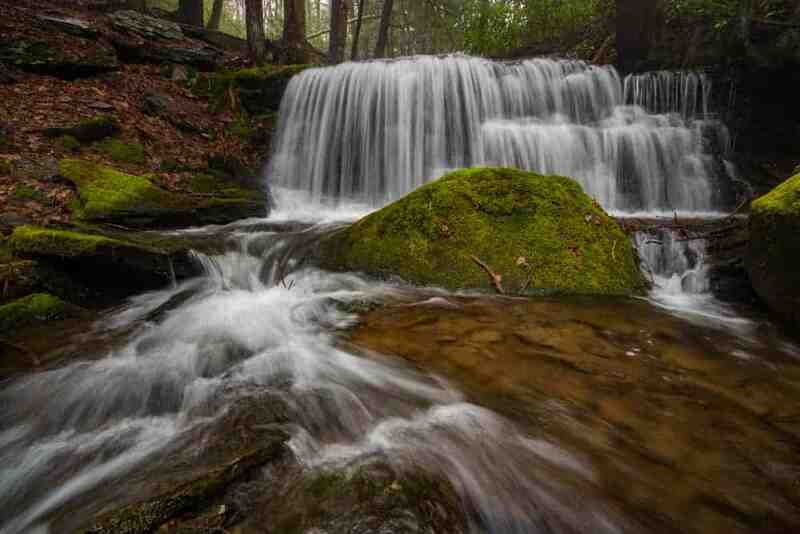 The beautiful Yost Run Falls. From the parking area along Route 144, it’s about a mile and a half hike to Yost Run Falls. The first two-thirds of the trail follows along a reasonably well-maintained gravel road. However, the gate blocking the road prevents driving down the road to get closer to the falls. Along the way, the road passes two hunting camps. Keep in mind that while the trail is public, these camps are private property. Please do no disturb them during your visit. One of two hunting camps along the trail to Yost Run Falls. Once you get to the second camp, look for a small trail that heads off to your right. This trail will follow Yost Run downstream for about five minutes until you reach the top of Yost Run Falls. 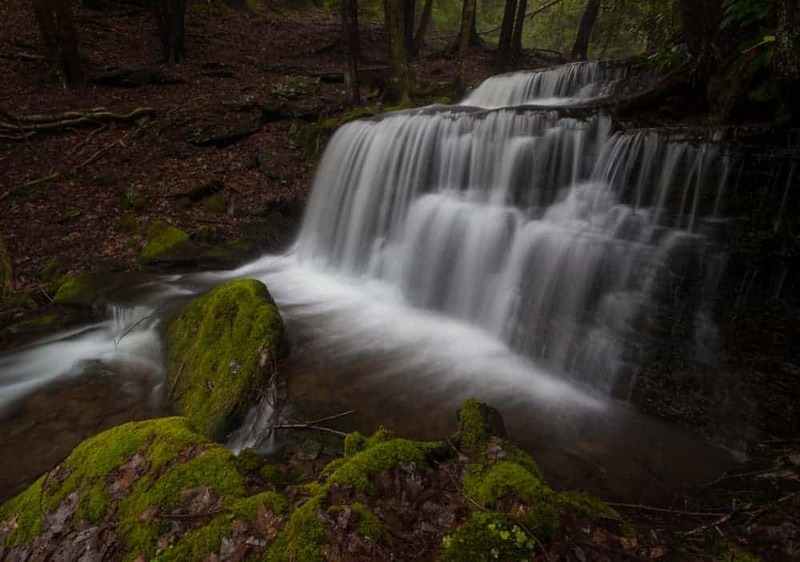 While Yost Run Falls isn’t a large waterfall, only about 12-15 feet in height, it makes up for it in sheer beauty. Honestly, this is one of the prettiest waterfalls I’ve seen in Pennsylvania. I just love the way the water cascades directly off of the falls in a near perfect stream. Surrounding the waterfall is a beautiful forest and moss-covered rocks. With the waterfall being located directly next to the trail, it provides many great angles to get photos. 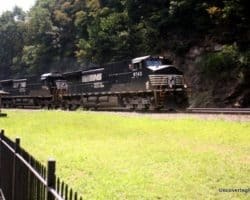 My personal favorite was shooting from the Chuck Keiper Trail itself, but I also got some nice shots both in the middle of the creek and from the far bank. Before you leave the area and head back to your car, walk less than 100 yards further downstream to see Kyler Fork Falls. 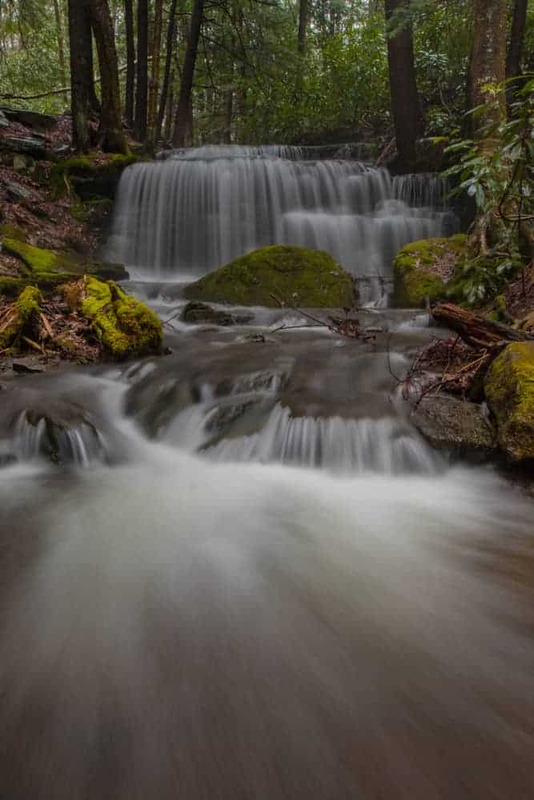 Located just upstream of where Kyler Run meets Yost Run, it is very similar to the previous Sproul State Forest waterfall in both height and look, and offers another scenic drop to enjoy and photograph. A side view of Kyler Fork Falls. While you can see Kyler Fork Falls from the Chuck Keiper Trail, you’ll need to cross Yost Run to get a good look at it and for photographs. The best place to cross Yost Run will vary based on water levels, so use your best judgement in finding your way across. Depending on the water level, it may not be possible to do this without getting your feet wet. There is a trail that runs up Kyler Run. Based on the official map, this trail likely runs up to Yost Ridge Road. However, I’ve heard that there isn’t anything of note above Kyler Fork Falls. Another view of Kyler Fork Falls. To return to your car, simply turn around and go back the way you came. You’ll likely have noticed that the trail was downhill the entire way to the falls. This means that the trip back is all uphill. In total, there is about 500 feet in elevation difference from the parking area to Yost Run Falls. However, given that this is spread out pretty evenly over the mile and a half hike, it shouldn’t pose much of an issue for most. The Chuck Keiper Trail runs right next to Yost Run Falls. 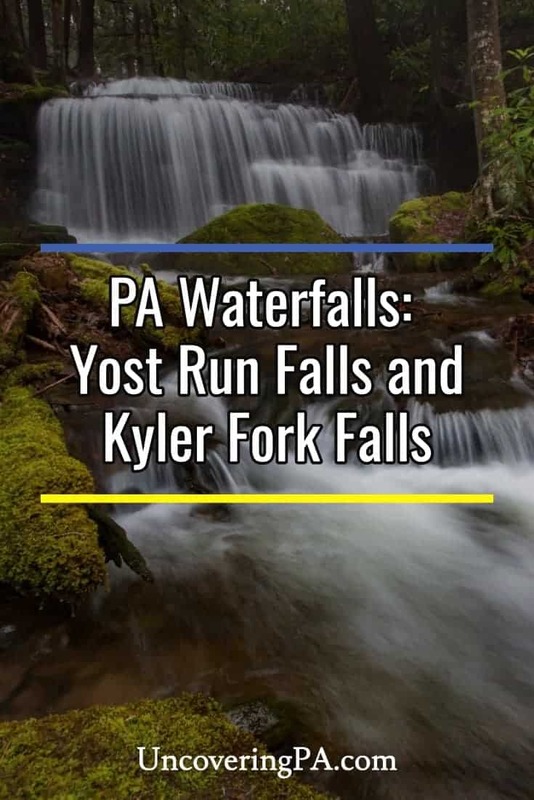 I’ve visited well over a hundred waterfalls in Pennsylvania, and Yost Run Falls and Kyler Fork Falls rank up there as some of the best. What they lack in awe-inspiring height, they make up for in beauty, as well as being remote, but easy-to-reach. 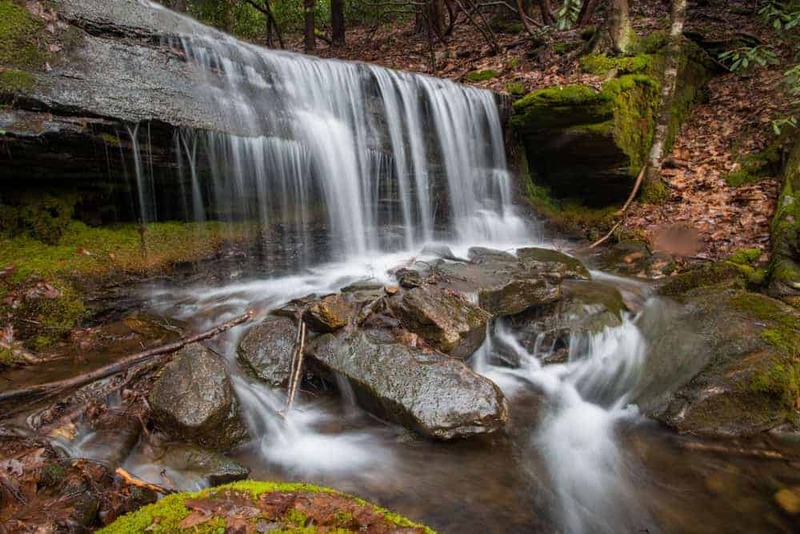 If you’re looking to get off of the beaten path and see some great Pennsylvania waterfalls, you won’t want to miss these two gems in Centre County, PA.
Yost Run Falls from the bank opposite the trail. 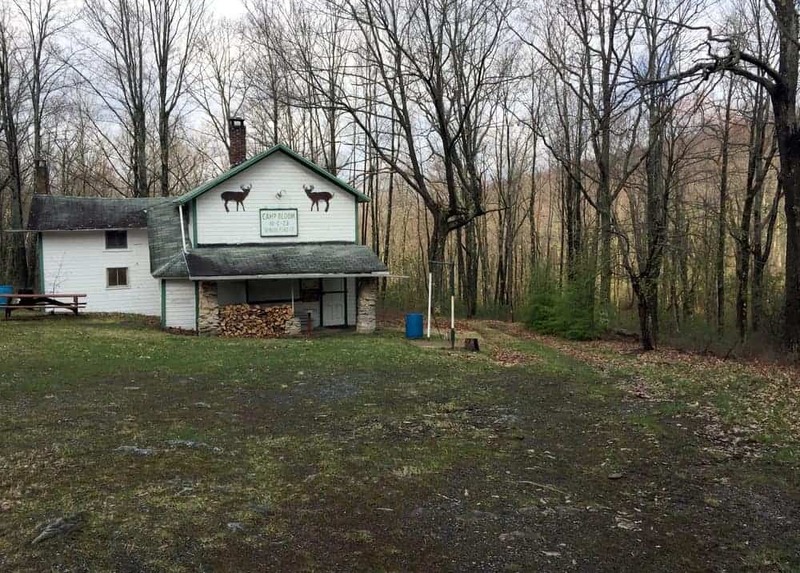 The parking area for Yost Run Falls is located off of Route 144 north of Moshannon, Pennsylvania. 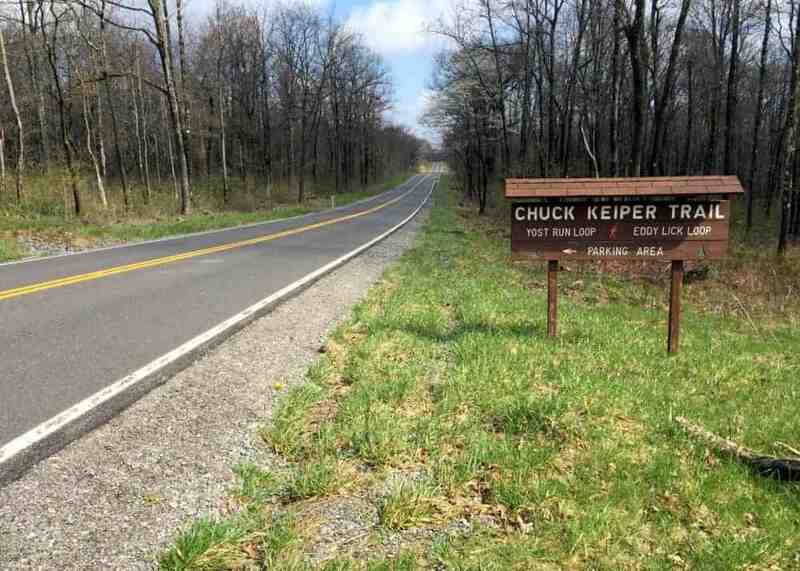 When driving north on the road, you’ll see a small wooden sign that reads Chuck Keiper Trail on the right side of the road. The parking area is just off the road to your left. It can be found at the following coordinates: 41.175518, -77.879148. 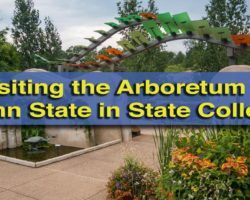 This parking area is located about 25 minutes north of the Snowshoe exit off of Interstate 80 and is about an hour north of State College (which is home to the amazing hiking on Mount Nittany). This sign for the Chuck Keiper Trail marks the parking area for Yost Run Falls. There is a small information kiosk at the parking area that has a map that you can look at before hiking. From time to time, there are also maps here that visitors can take. 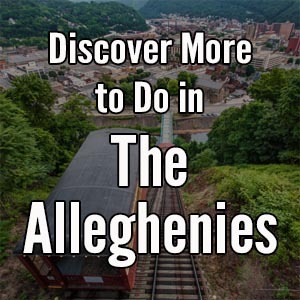 Given the remoteness of the area, pick up a map here if they are available. 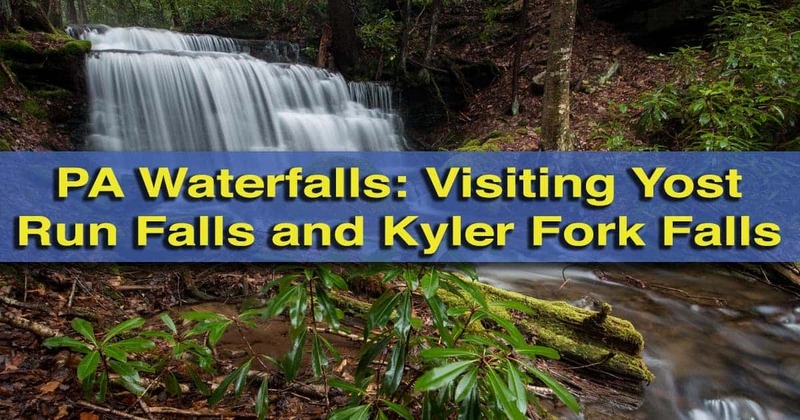 The hike to Yost Run Falls and Kyler Fork Falls will likely take you about 30 minutes going down and about 40 minutes when returning. Looking upstream at Yost Run Falls. Follow the well-defined gravel road away from Route 144. After hiking for a couple of minutes, you’ll come to a split in the trail. Straight ahead is a rusty, brown gate. To your left, there is a yellow and black gate. Head left to follow the road past the yellow and black gate. Continue following this road for around a mile. You’ll pass the first hunting camp about halfway down and the second camp adjacent to Yost Run. 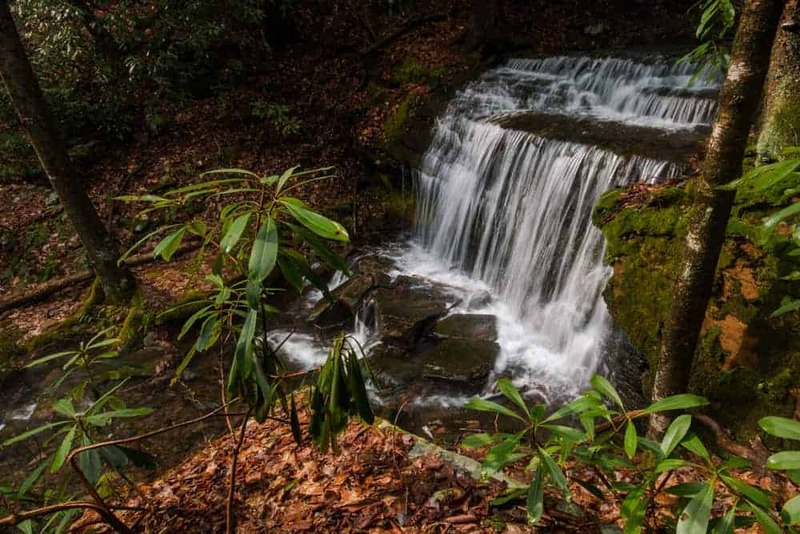 At the second camp, turn to the right to follow the small, but well-defined trail the rest of the way to Yost Run Falls and Kyler Fork Falls, the Sproul State Forest waterfalls. 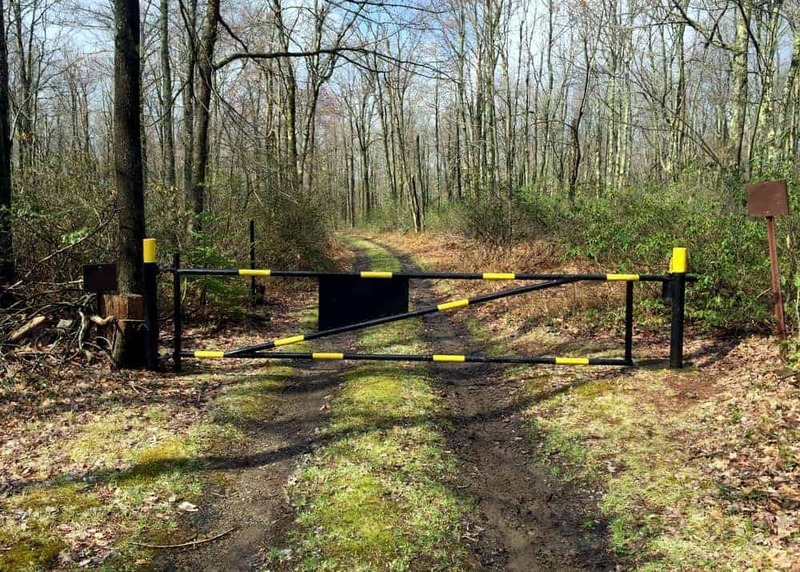 Walk past this gate on your way to Yost Run Falls and Kyler Fork Falls. 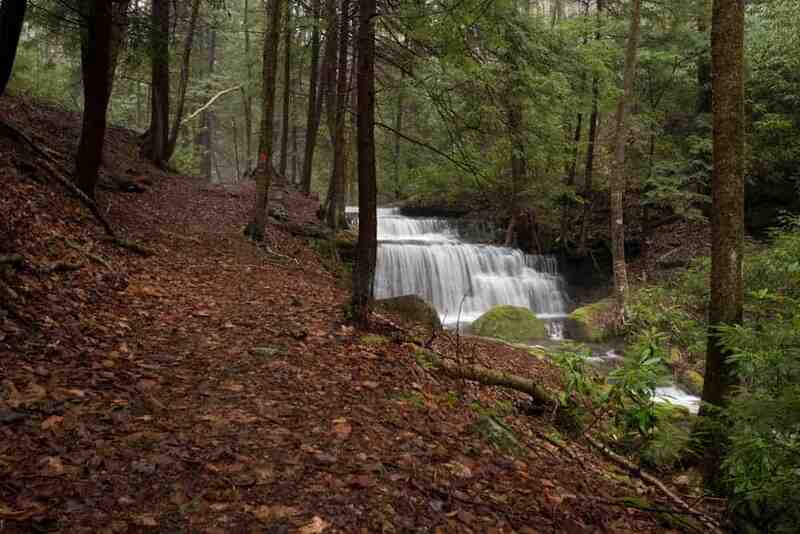 Yost Run Falls is located at approximately the following coordinates: 41.173889, -77.900608. Kyler Fork Fall is less than 100 yards further downstream. I drive this road often and never knew there were falls along the way. I will have to check them out. Thanks! We visited the falls today and found them to be awesome. Your directions were well written and easily understood. Thanks! 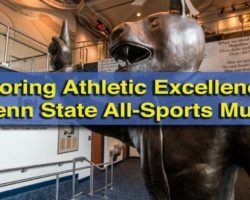 That’s great to hear! Glad you had a fun visit.